Sdedi has been around for 5 years and they have optimized their platform in order to give the best value and price to their customers. They have 2 kinds of seedbox plans – SdediBox & SdediOne and their servers are located in France. SdediOne is designed for downloading and streaming files. This plan has unlimited storage, unlimited bandwidth & access to SdediOne Player. SdediOne Player is a platform used for streaming multimedia content. 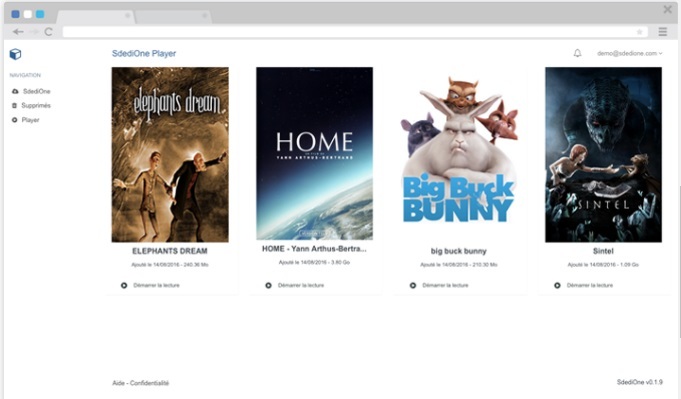 It allows you to play your videos simply after having loaded them into your Seedbox. It organizes your files into a library for easy access. We tested out 8 torrents using public trackers and the initial download speeds was around 50Mbps and later on dropped between 25-30Mbps. Some of the torrents did not download though which did not happen on other seedbox providers using the same torrent files. Top notch customer service is very important in order for businesses to retain customers and hopefully bring new ones. Sdedi webiste looks clean and friendly to the eyes. As mentioned above, they offer 2 different kinds of seedboxes, SdediBox & SdediOne and we find it confusing that you will need to sign to 2 different accounts if you want to access each of the seedbox type. It would be better if all seedbox access can be consiledated into one account. The support team can be contacted via the contact us page and support page. A Frequently Asked Question page is not available ufortunately. SdediBox used ruTorrent as their main client and already includes plugins such as loginmgr, getdir, noty, noty2 & autotools. An android app is also available for this plan. SdediOne uses their own SdediOne v1.0.0 client. The player supports .avi, .mov, .flv, .wma, .mkv, .mpg, & mp4 files. A File manager is included in both types of seedbox.